Fall has arrived and we’ve started feeding the birds again. Migrating visitors like this female rose-breasted grosbeak are passing through. We must not have the right habitat for summer habitation but we see males and females regularly on their northern and southern migration treks. This female has been with us for several days eating sunflower seeds and peanuts. The last two of our hummingbirds left just before the remanents of Hurricane Florence blew through. We’ve had one straggler at a single nectar feeder we keep out. We may get more! We see cardinals in the neighborhood all summer. 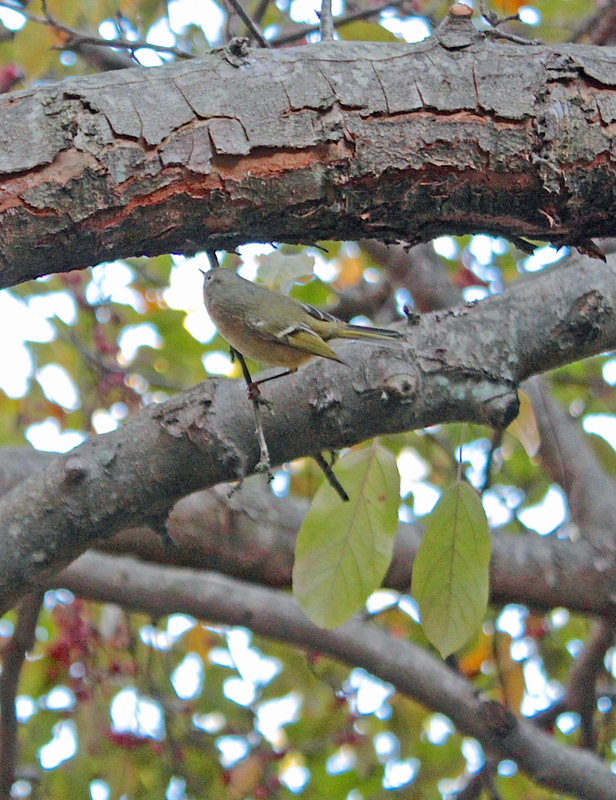 They visit us in the spring when the serviceberry trees are producing sweet berries but dine elsewhere all summer. Adults and several juveniles are happy visitors again eating their favorites….. sunflower seeds and suet. We had an abundant robin population this summer with one pair successfully nesting in our doublefile viburnum. (The cat that ate the last nesting of babies three years ago in this shrub has moved away with its owners. Yippee!) Most of our robins have migrated but others are stopping for viburnum berries. This shrub will soon be berry bare. Other berries in the yard that attract birds are the blue berries of our tall juniper that aren’t really berries at all. They’re the spherical fleshy cones that are eaten by cedar waxwings, robins and even turkeys last winter. Our many chipping sparrows used the tree to roost all summer. They have migrated but we expect the white-throated sparrows to arrive this fall and use the evergreen as shelter from the cold. And the favorite of the phoebe are the dark berries of the viburnum dentatum below. These shrubs had a growth spurt this summer with the July rains and the three shrubs are loaded with juicy black berries. It’s also a favorite food for the catbirds that disappear deep into the growth. All we can see is a quivering shrub until they fly out with a mouthful. 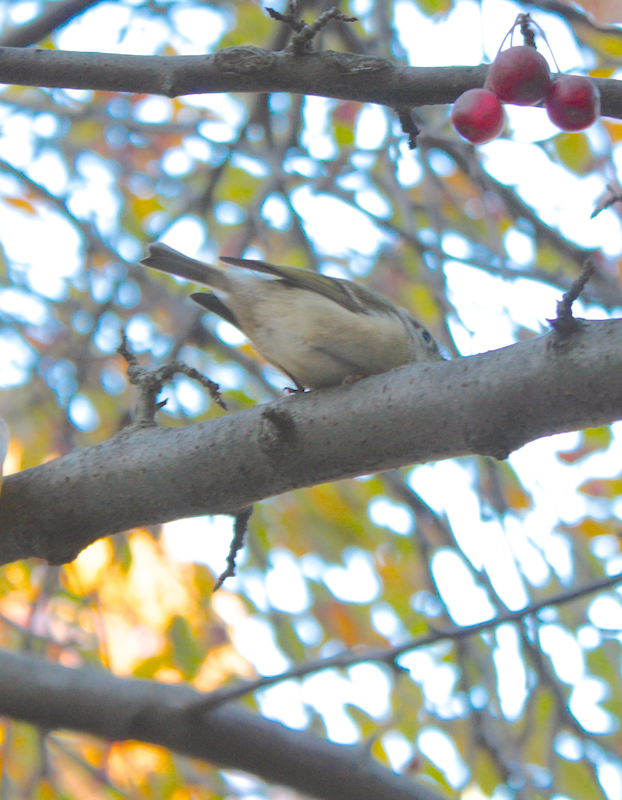 I think I’ll miss the catbirds the most when they go south. We had plenty of them to keep us entertained this summer. It’s amazing that we can tell several of them apart either from behavior, friendliness, or their ‘meow’ when they see us. There is one we call ‘Screamer’ who wails continuously and follows me around the yard. He (she?) raises the pitch when I appear with fresh mealworms. Spoiled…. And so it’s goodbye to our summer feathered friends and welcome to all migrators and winter visitors at the feeders. 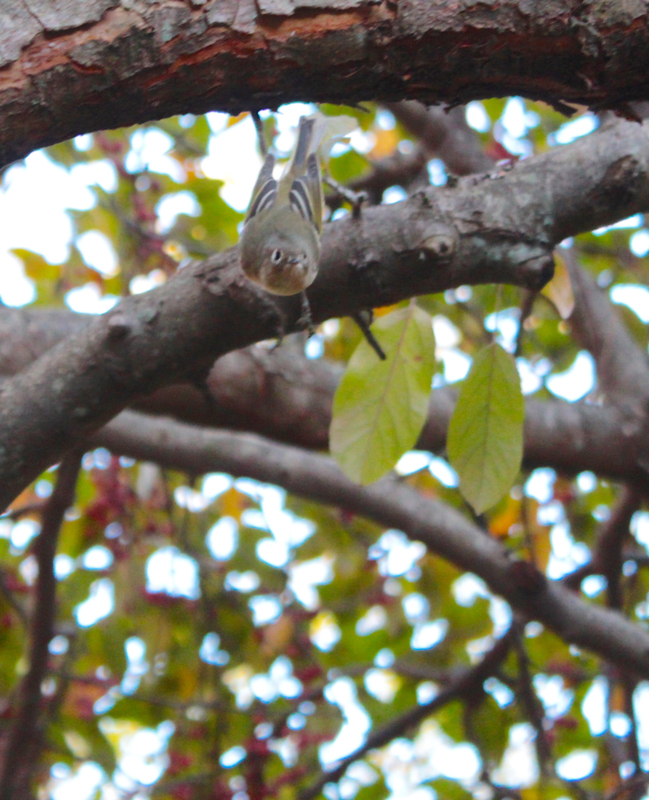 ….and thank you for the meal worms,” chirped a friendly pine warbler on his way through town.